This course prepares you for the "intacs™ Certified Competent Assessor (Automotive SPICE®)" examination. As a prerequisite you are already an intacs™ Provisional Assessor with initial experience in performing assessments and you have some practical experience in applying Automotive SPICE®. 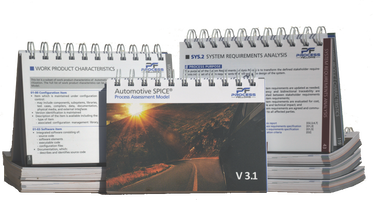 "Automotive SPICE® v3.1" is used to evaluate and improve development processes in the system and software environment. It is the automotive-specific derivation based on the requirements of ISO/IEC 330xx. The seminar offers the opportunity to exchange experiences among the participants and to deepen their knowledge of the process evaluation model. This is supported by specific individual tasks and group work. Before the seminar starts, you will receive some topics to be presented by you during the training. You have to participate actively in the practical parts of the training. The trainer has to evaluate and document this during the training. You have to pass a multiple-choice examination. This exam is conducted independently at the end of the training. It is recommended to prepare and follow up the training material on each day of the training. You have to apply for the certification at the VDA after passing the examination. This is an additional process after the training. Registered Provisional Assessors who have gained experience in assessments and want to lead Automotive SPICE® assessments on their own in the future. Participants should have assessment experience. Participation in the course and the examination are independent of the requirements for certification as Competent Assessor Automotive SPICE®. Exam Fee (plus VAT): EUR 550.00 p.p.